When Princeton historian D. Graham Burnett answered his jury duty summons, he expected to spend a few days catching up on his reading in the court waiting room. Instead, he finds himself thrust into a high-pressure role as the jury foreman in a Manhattan trial. There he comes face to face with a stunning act of violence, a maze of conflicting evidence, and a parade of bizarre witnesses. 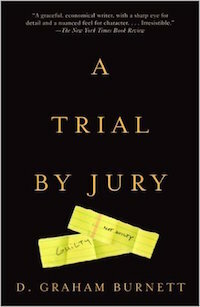 But it is later, behind the closed door of the jury room, that he encounters the essence of the jury experience — he and eleven citizens from radically different backgrounds must hammer consensus out of confusion and strong disagreement. By the time he hands over the jury’s verdict, Burnett has undergone real transformation, not just in his attitude toward the legal system, but in his understanding of himself and his peers.